Jeanne Stangel, a longtime UW-Green Bay administrator with experience in fundraising and intercollegiate athletics, will be leaving the University to accept a newly created position with Notre Dame de La Baie Academy in Green Bay. Stangel starts Aug. 3 as Notre Dame’s vice president for institutional advancement. She will direct fundraising, strategic initiatives and communication, and serve additionally as the Roman Catholic high school’s director of athletics. 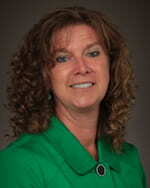 At UW-Green Bay, Stangel serves as Vice Chancellor for University Advancement and President of the UW-Green Bay Foundation, Inc. A member of the institution’s executive team, she oversees the University’s fundraising, alumni, marketing and communication functions. A native of the Algoma area and a 1987 graduate of UW-Green Bay’s Business Administration program, Stangel has held a variety of positions with the University over 25 years as a student, administrator and advocate. Stangel joined the University Advancement staff in early 2012, moving over from Intercollegiate Athletics, where she was associate athletics director, senior women’s athletics administrator and director of the Phoenix Fund, the fundraising arm of UW-Green Bay Athletics. In previous stints with the University, she had served as director of government and community relations, special assistant to the chancellor, and assistant athletics director. Her private-sector experience includes marketing and management positions with IBM in Wausau and The An-Ser Service, Medalcraft Mint and TufcoTechnologies, Inc., of Green Bay. She was a member of the executive leadership team and senior manager of customer services and corporate relations for Tufco, a publically traded company, from 2002-2006. Stangel was inducted in 1993 as a charter member of the UW-Green Bay Athletics Hall of Fame. A native of the Algoma area, she played from 1984-87 and as Jeanne Barta still ranks first and third, respectively, on the all-time Phoenix women’s basketball rebounding and scoring lists. This entry was posted in Headlines and tagged Advancement, faculty/staff, women's basketball on July 16, 2015 by Christopher Sampson.